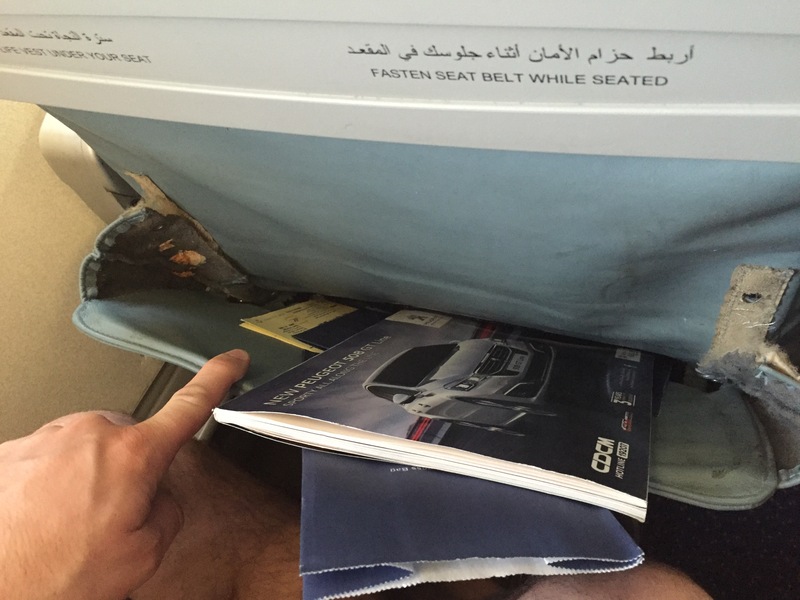 EgyptAir Adventures, "Business Class" Embraer 170 | No Mas Coach! 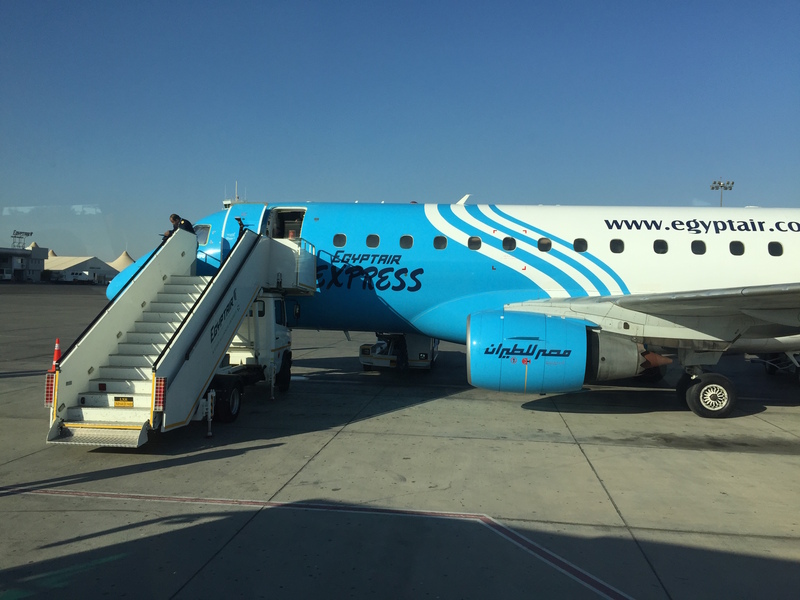 To get around Egypt you’ve got three options: Tourist trains and buses, which take forever and come with armed guards, a Nile cruise which could take days at a time, or EgyptAir. In the interest of time, we opted for choice number 3. 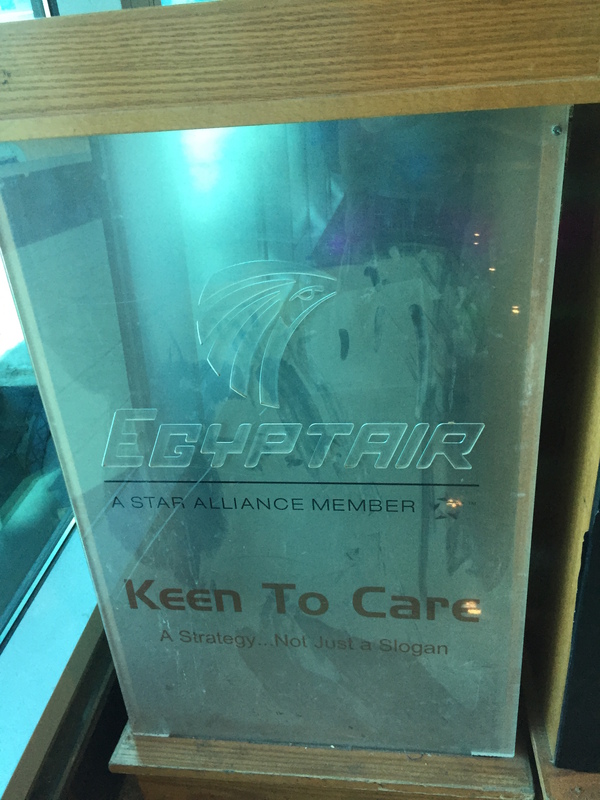 Everyone that we spoke to had the same reaction when we told them that we’d be flying on EgyptAir. 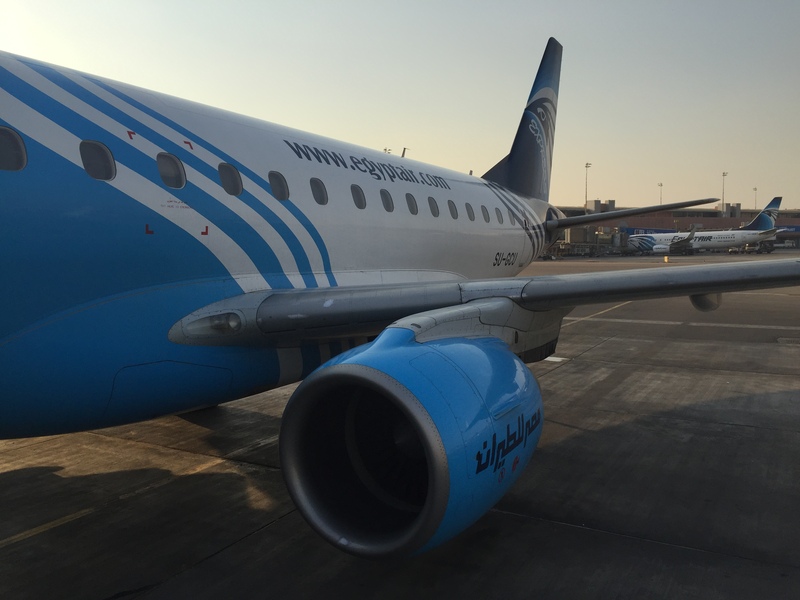 The best description I can come up with is sort of an “EEK – are you SURE?” But we’ve gotta say that EgyptAir truly exceeded our expectations, not that they were too high to begin with. 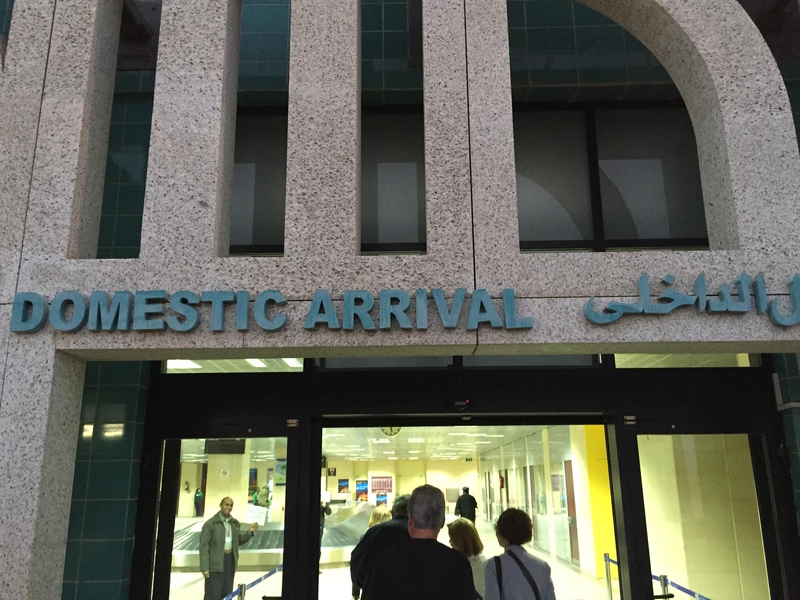 Our driver Farag (biggest Lindsey Lohan and Jean Claude Van Damme fan you’ll ever meet) dropped us off right at the entrance to the domestic terminal and helped us to shoo away the swarm of people coming to offer us help with our luggage. 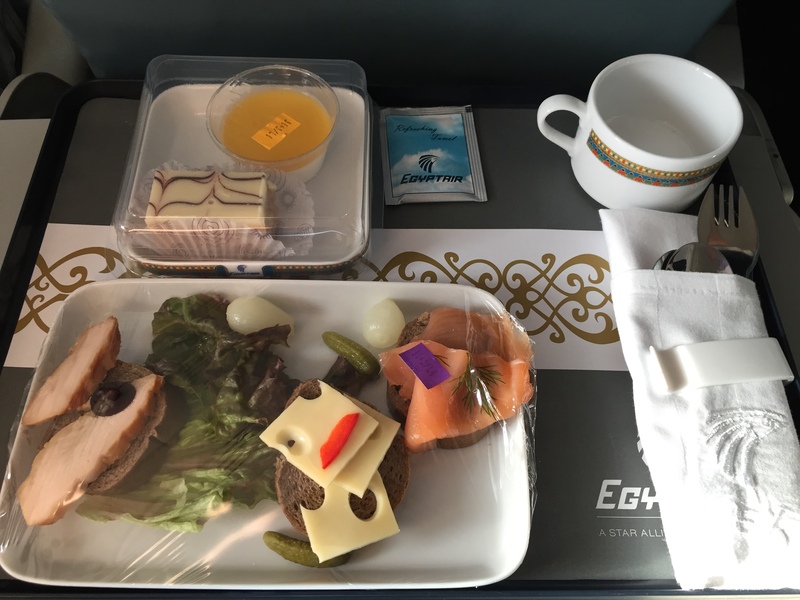 The price difference between business class and coach class was something like $10. So, obviously we opted for the business class seats! Sometimes it’s not just a matter of finding the best deal or looking for the biggest discount, it’s just a matter of looking to see what business class costs. You might be pleasantly surprised. 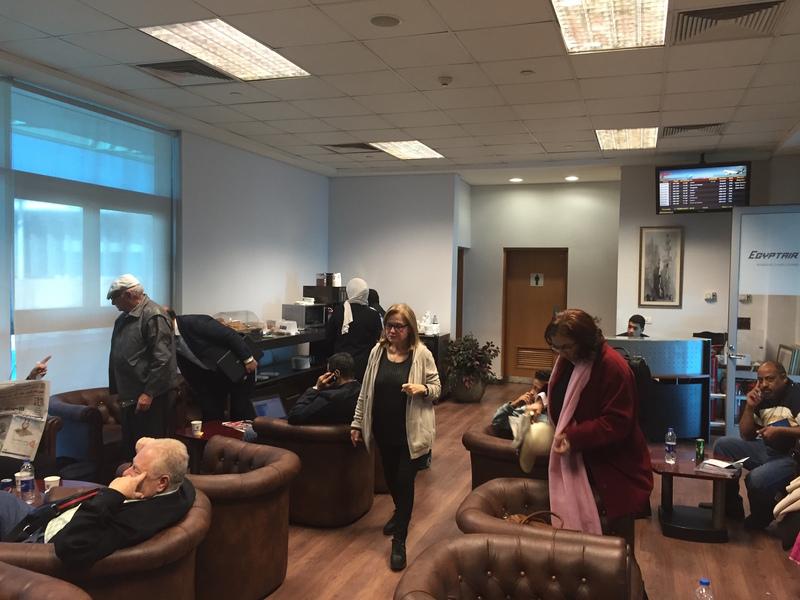 With business class seats we got access to the business class lounge in Cairo. 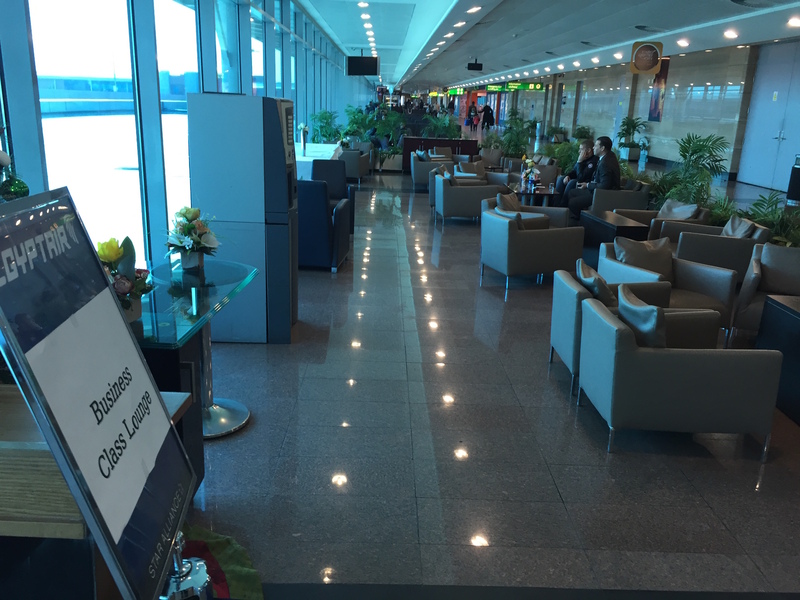 As we followed the signs for the domestic departure gates the next sign pointed us to the lounges. I say lounges because yes, there were indeed two. One was outside in the hallway and one was an actual lounge area in its own room. Yea, you read that right, a lounge in the middle of the hallway. 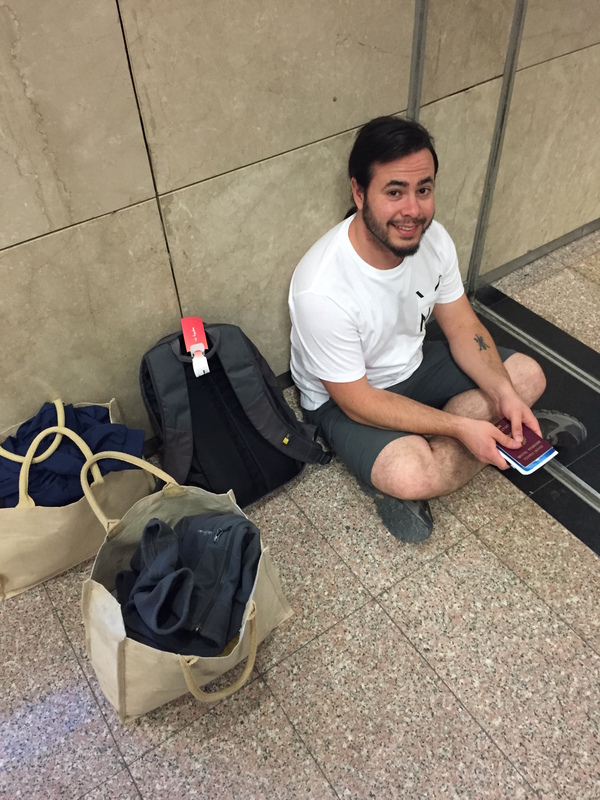 Behind us was the entrance to the actual business class coat closet lounge. In total there were about 20 seats. These two pictures show the entirety of the lounge. 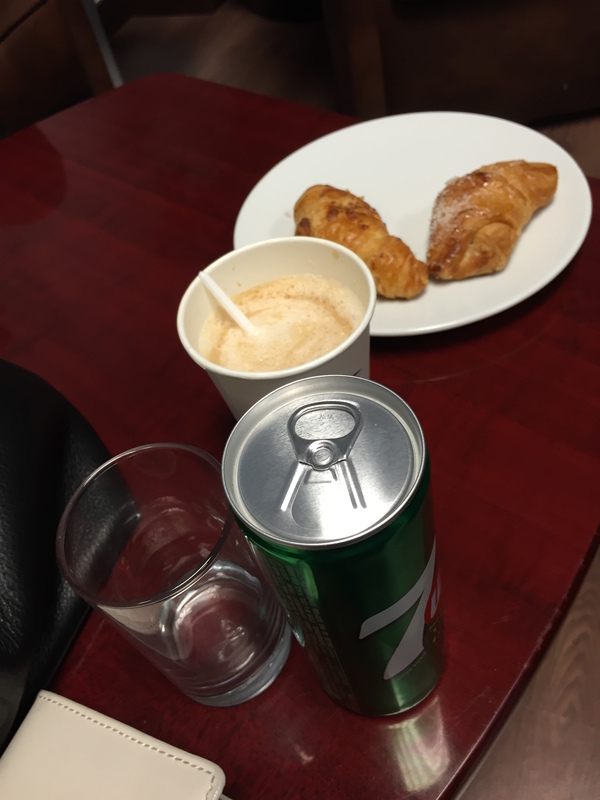 A coffee machine and cans of coke with lids like I haven’t seen in decades. We left the lounge for good reason. There wasn’t much going on and we didn’t wanna be trapped in a lounge with way too many people, crap food, and really horrible seats. We went out walking around and found a ghost town. 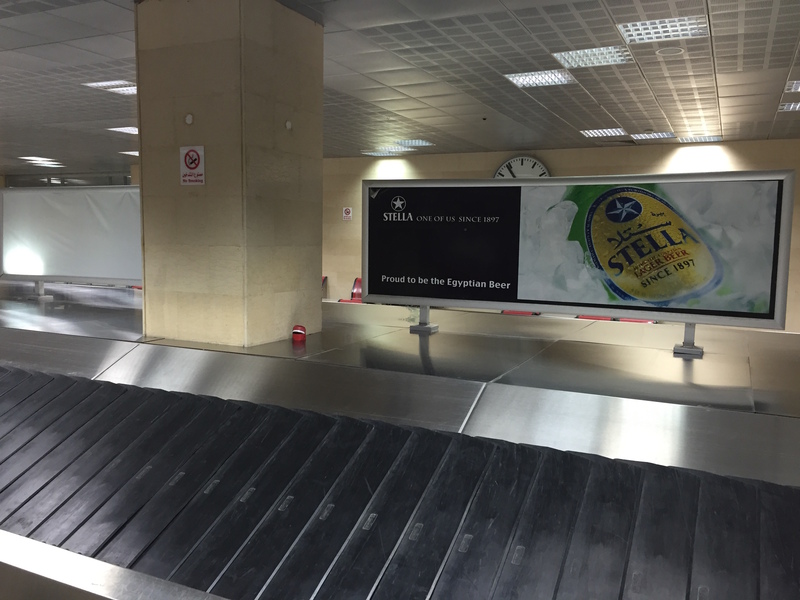 No seriously, just take a look at how empty the terminal was. 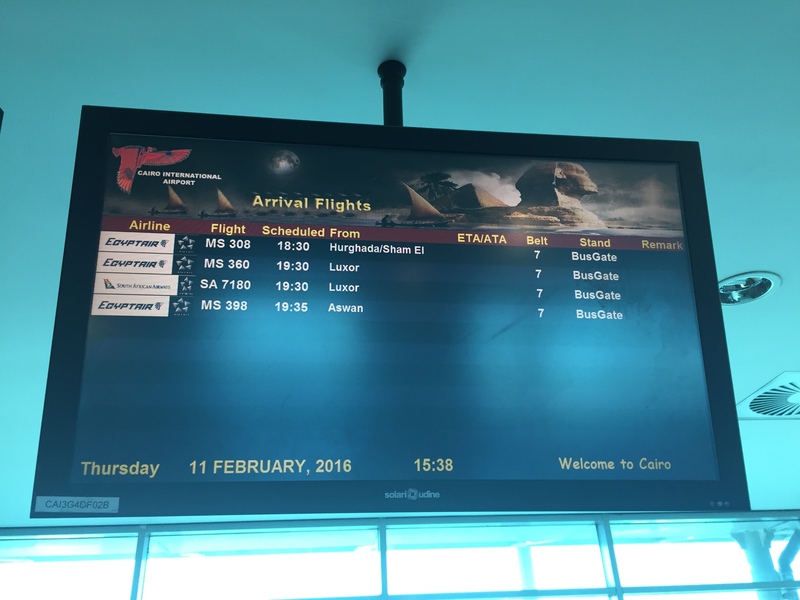 There was on average one flight leaving an hour from the domestic terminal and two flights arriving per hour. 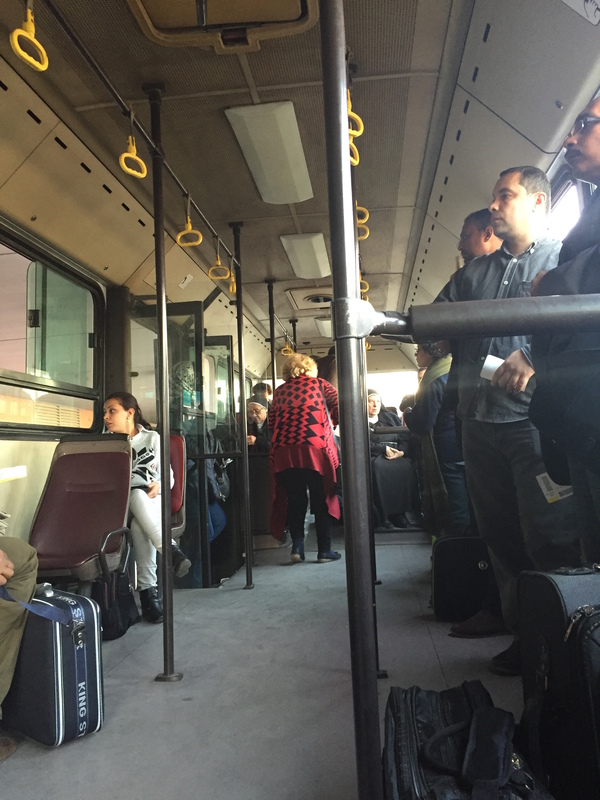 We headed to the gate, boarded rather uneventfully, and headed to the bus transport, and off to the plane. When we boarded we found economy class seating with a curtain behind us making a “business class” cabin away from economy. Surprisingly the cabin was full. All 8 economy business class seats. 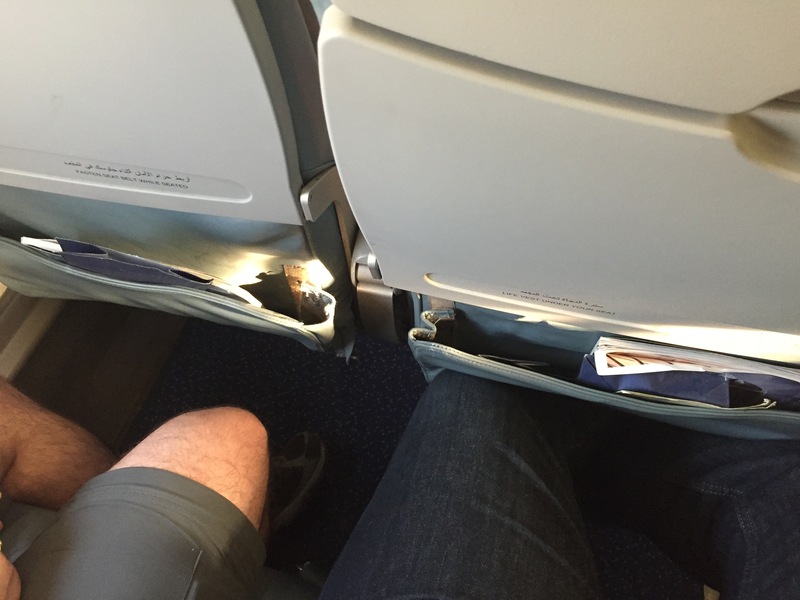 Just check out this leg room! Spirit airlines eat your heart out! And a mysterious liquid was leaking out of the vomit bag container on the wall. 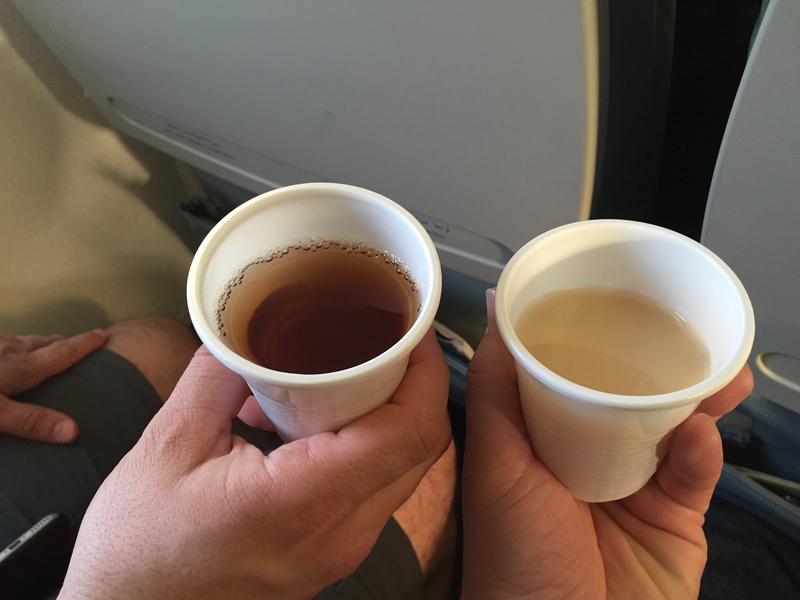 We were offered a pre departure beverage, but only after all the economy class passengers boarded. 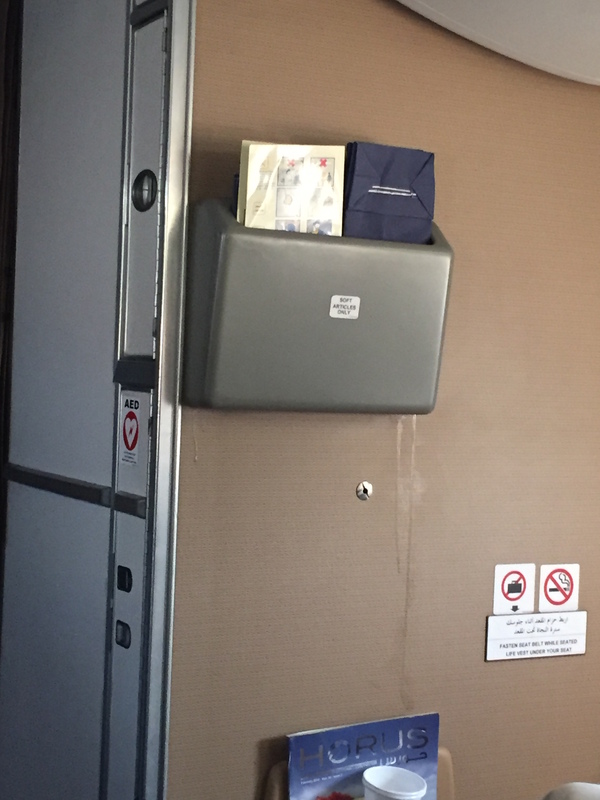 Then the lovely flight attendant proceeded to close the curtain between the two cabins so no one in economy would see that we got pre-departure beverages. 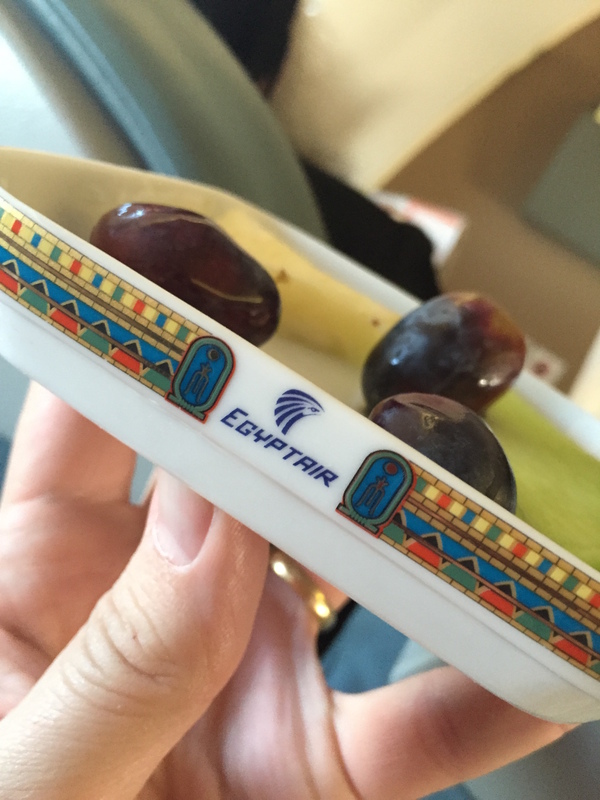 EgyptAir is a dry airline so no champagne here, just some wonderful fruit juices to try. Just after take off the curtain was closed again and the service started. 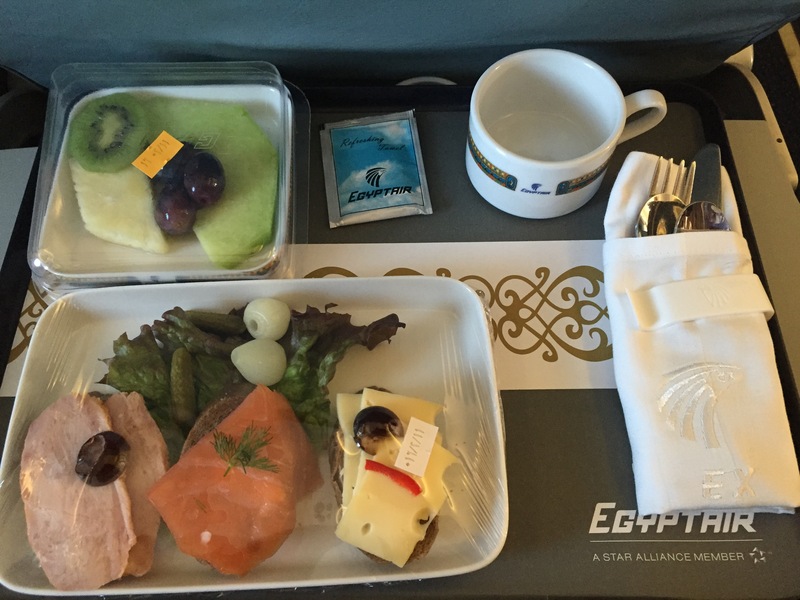 Being that it was a short one hour flight we were offered a pre-plated snack, consisting of coffee/tea, juice/water, a fruit selection, and three small open faced sandwiches of cheese, salmon, and turkey. 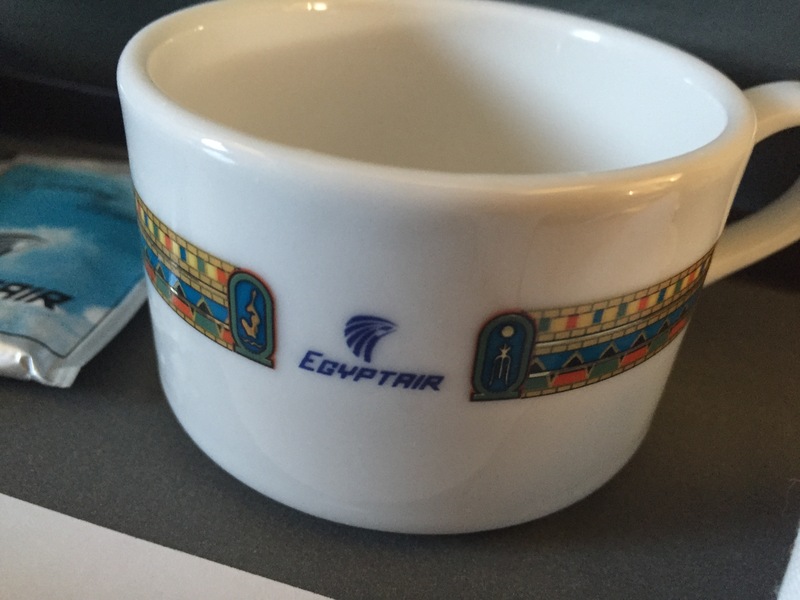 One of the most awesome parts of EgyptAir is their really cool cups and plates. Just look at the design. It’s gorgeous! The Hilton hotel shuttle took us back to the hotel and once again, the awesome driver helped us to shoo away the swarm of people trying to help us with our luggage. We cleared security and proceeded to the most epic, most amazing, and most gorgeous business class lounge we’ve ever experienced. You can read that post here. After leaving we walked out onto the tarmac and onto our flight, it was the same E170 that we took flying down here the day before. 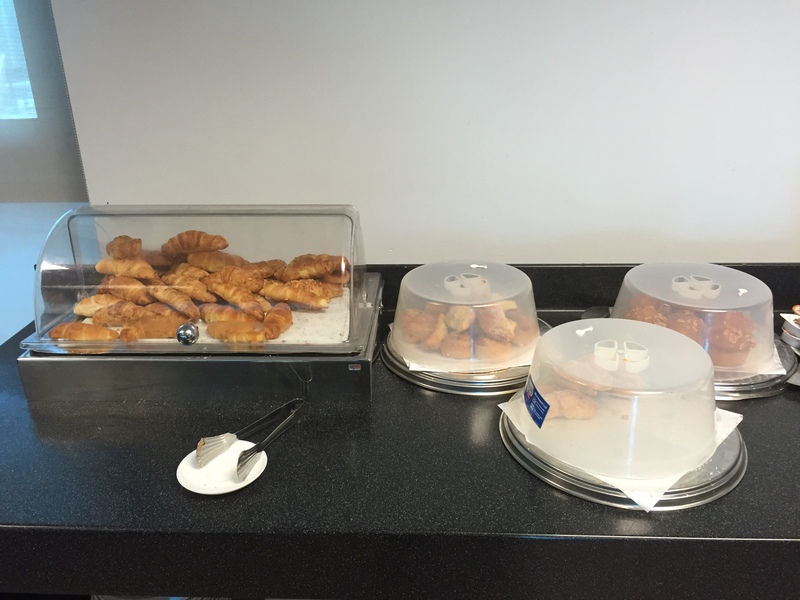 As could be expected, the service was almost identical, except for the fruit platter was replaced with a selection of pastries. 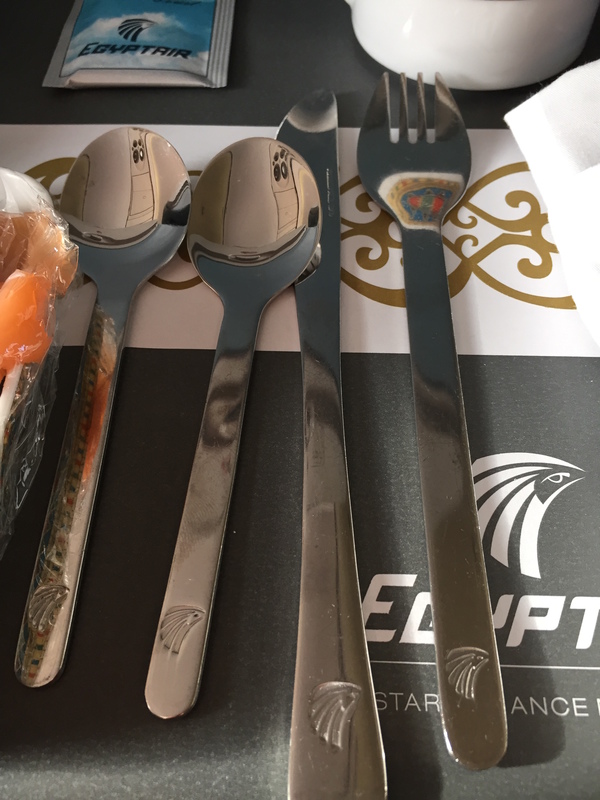 Another interesting part of EgyptAir is there seems to be no rhyme or reason to the selection of their silverware. If you notice Ben had 2 spoons, a proper fork, and a proper knife. 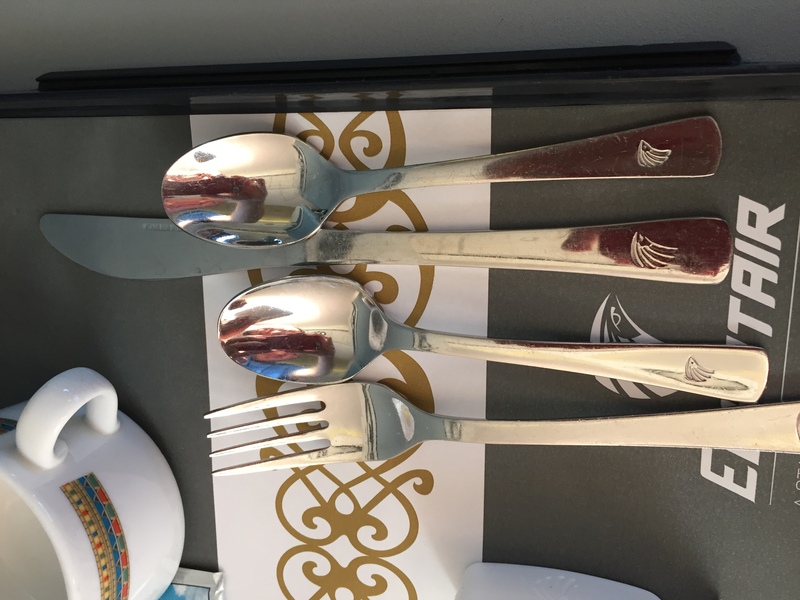 My silverware however included two different spoons, a butter knife, and a SPORK! Yes, a SPORK! 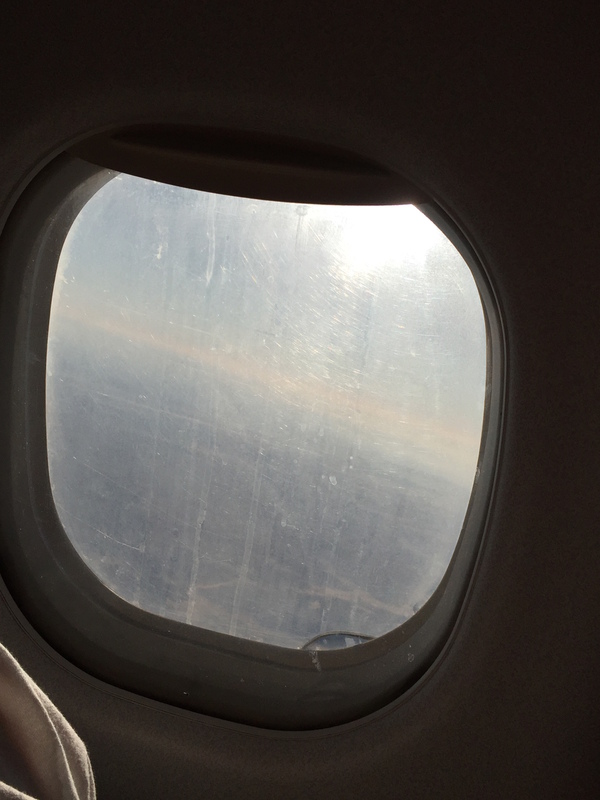 Once again, since it was just a short flight everything was collected and we landed quickly and without incident. After we arrived, most people left the plane and collected their luggage, but we had to do a transfer onto an international flight. Instead of turning left and going up the stairs, we had to turn right and go through additional screening and passport control. The problem? 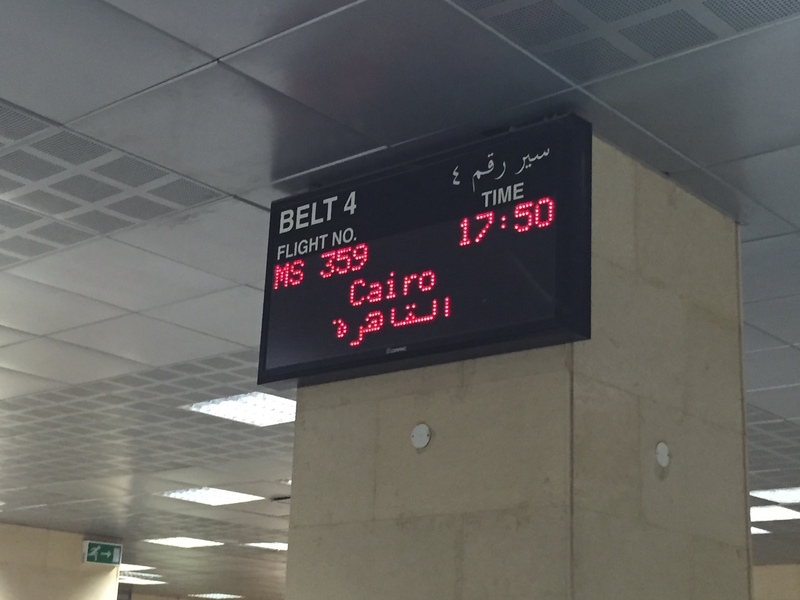 Apparently no one actually connects in Cairo. Ever. No seriously… they never do. How do I know this? 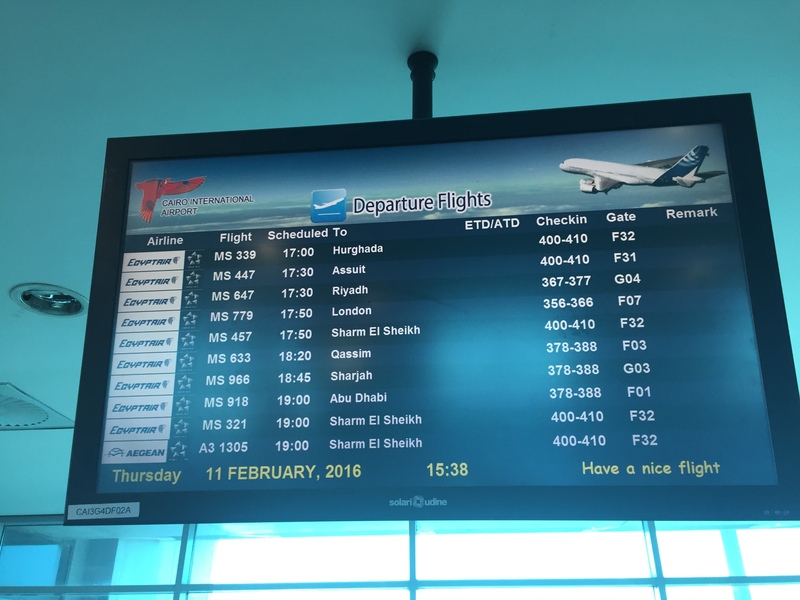 Because when we arrived at the passport control the agent had never heard of Sharjah and wasn’t even sure that it was an actual EgyptAir flight. We were told to sit and wait while someone came by with the stamp to allow us to proceed. After that we got our bags scanned and ran into a problem. My bag included some M&M’s, and the agent had no idea what they were or why I had them. You try explaining to someone who doesn’t speak English what an M&M is and why it’s not a security threat. 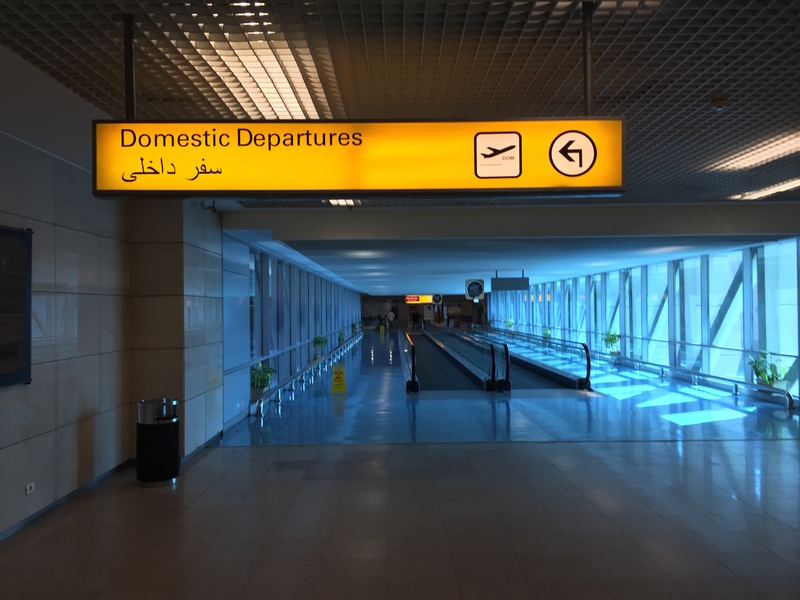 After a few strange moments we cleared both security and passport control, and went on to our connecting flight to Sharjah.